...but along the way, we found the time - and the courage! - to send a preview off to some of our favourite reviewers and websites. We've been biting our nails to see what they think but first posts have now gone live. Now it's time to reveal our hand. It's finally here! 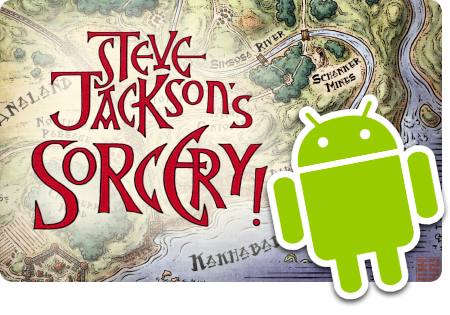 You can now start your adventure in search of the Crown of Kings in the acclaimed first part of Steve Jackson's Sorcery!, available for Android devices and Kindle Fire. Find out more on the main Sorcery! page, or get started straight away! Sorcery! is an epic adventure in four parts - a journey where every decision is yours to make, and every danger is yours to face. Along with a simple but compelling combat system and a gamut of weird and wonderful spells to cast, the game features thousands of choices - and every one you make is remembered. Will you be kind and honourable, or cruel and selfish? Will you starve, or feast? Will you uncover the secrets of The Shamutanti Hills? Adapted from the million-selling series by Steve Jackson, part of the Fighting Fantasy series co-created with Ian Livingstone, Sorcery! is an interactive story the like of which could never have existed on paper. Using inklewriter technology the story rewrites itself in real-time around your actions, so every play-through is different. Part 2 of the adventure has already been released for Apple devices and will be out on Android within a few months, and we're aiming to release the last two parts of the story simultaneously on both platforms later in the year.